If you have a small or medium-sized company (or if you head a corporation) you will surely be interested in reading this. One of the translation specialities that has aroused the most interest in recent years is the translation of financial documents. This need for high-quality specialised translation has increased due to several factors: perhaps the main one is the internationalisation process on which hundreds of companies of all sizes have embarked. All of them have decided to follow one of the strategies recommended by commercial advisors and financial experts: entering markets all over the world, internationalising products and services to access new clients, thus opening up new and interesting paths for financial growth. 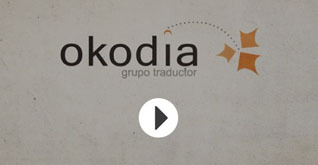 One of the reasons why so many companies entrust Okodia – Translation Group with their translation is the need to have a trusted partner that guarantees the quality of their financial translations. When these companies decide to offer their services or products abroad or work with American, Asian, African or European partners, they acquire a number of commercial and fiscal commitments in the location where they establish themselves: balance statements, accounts, payrolls, contracts, agreements, share price, viability reports… and as can be expected, a large number of financial documents must be delivered in the local language where business takes place. In this international scenario, it’s crucial to have a linguistic partner, a specialised translation agency that can translate these important financial documents in a rigorous, accurate, transparent, and most importantly, a completely confidential way. “A perfect translation of a complex business plan. Met the committed deadlines. Recommendable”. You company will use the fiscal terminology used in the place where you do business. You will ensure that the contents of your documents are adapted to the local culture and idiosyncrasy of each territory. By increasing the quality of your translated documents, you will close commercial agreements more quickly. Did you know that the economy of emerging countries has grown seven times more than that of the United States in the last decade, and that business in these countries is done in languages other than English? Even though many financial guidelines are shared across European countries, there are many significant fiscal differences among their Member States. If your goal is to work in Asian, American, Arab or African countries, these differences multiply. Financial translators cannot limit themselves to translating words from one language into another; they must be familiar with the economy of the location where the documents will be submitted, the special vocabulary to use, and the details that cannot be lost in the translation process. In the field of financial translation services, stock documents are particularly sensitive. Their translation must be rigorous and accurate for various reasons, but the main one is perhaps the fact that they will allow the company to operate in very different ways in the main global Stock Markets. Okodia – Translation Group provides qualified translators with expertise in stock and securities: professionals who are familiar with the operation of the main European, American and Asian stock exchanges and with the main securities indexes. These professional translators adapt stock documents to the specific local vocabulary in each country and financial market. You have a translation team of experts both in the local language and in economics and finance. You ensure total confidentiality of the financial data included in your documents. You work with a linguistic partner who is an expert in the professional jargon and who is familiar with the idiosyncrasy of the specific market in which you will operate. Tell us about your needs and we will give you a viable solution.